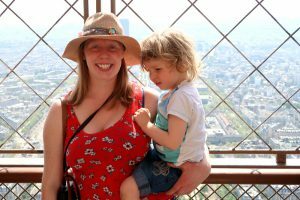 I blog over at Monkey and Mouse, which is a family travel and lifestyle blog. I’ve always wanted to be an explorer, ever since I was a small child and I refuse to let that change now I have kids. Travelling doesn’t necessarily have to be abroad, there’s a surprising amount of places you can travel in your own country too. So we tend to focus on travel in the UK as well as a few destinations abroad each year, but I find that our excitement for a trip is the same, no matter if it’s the tiny island of Coll or hopping on a plane to Croatia! I hope that this excitement to visit new places is transferred into words and pictures on the blog! As we can’t travel all year round I also write about our lifestyle, namely home educating our two boys and general life as a parent of crazy kids! I love that we can travel a couple of hours up the road or couple of hours on the plane with the kids and discover new sights, history and beaches. Looking at the world through the eyes of your children can remind you just how wondrous it is! Where has been your favourite place to visit? I don’t think I can choose just one favourite, that’s an impossible task! Our first trip abroad with both boys was to Venice, which was an amazing holiday. The city itself is gorgeous and there was so much to see, even with two small children in tow. Taking trips in water taxis, gondola rides, and plenty of gelato! Plus the islands of Burano and Murano were interesting to see with their colourful houses and glass working shops. Equally we had a fantastic holiday in Orkney, Scotland. We initially went to Orkney for a friend’s wedding, but spent many days afterward travelling around the islands, taking in the history, wildlife and playing on many beautiful beaches. What is your favourite place in Italy? And why? Even though Venice was one of my favourite places to visit, I also particularly enjoyed a trip to the Amalfi coast when I was a teenager. We stayed in Positano, although it was Pompeii and Herculaneum that caught my interest. Seeing Vesuvius rising above Naples does make you wonder if the people back then knew what was about to happen. What’s your best tip for travellers and holiday-goers? Keep an eye out for cheap deals on flights or consider travel using a different form, train is a good option for travelling within Europe, as is driving your own car. Also, don’t stick to the guide books. Take a few spontaneous trips on public transport, get lost and find somewhere you may never have visited otherwise. How do you decide what to do when you go to a new destination? Before we travel I look up the destination to find a couple of must see sights before we go and check if we need to book in advance. But I also like to wait until we are at the destination to choose other interesting places to visit from signs we’ve seen or leaflets picked up in the area. We found a few gems on our visit to the Peak District this way, even just spotting interesting looking caves on a map to visit! How do you decide which place is next on the ‘to go’ list? I have no way of deciding! Sometimes it’s because I find cheap flights, other times it’s because I find a great place to stay. As a blogger I am also offered press trips throughout the year and this has certainly made it easier for us to choose one destination over another. However, my list is huge, so there’s no easy way of picking which place to head to next!! What’s your favourite photo from your adventures, and why? I have been on many adventures around the world pre-kids, but my favourite photo has to be one that includes the kids. 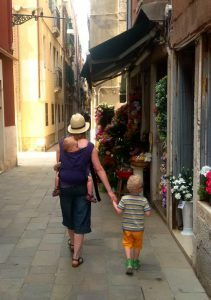 I love being able to show them the world and this picture of me walking along a back street of Venice when my boys were small is a perfect example of how parents can still travel and see the world despite having children. My two know a lot about the world and have a lust for knowledge, needing to find out more about this planet we all live on and why we need to care for it. What’s your go-to dinner party anecdote about your travels? Dinner party?! I am a mum to a 7 and 5 year old, we don’t have dinner parties anymore!! Instead we have play dates, walks and campfires with our friends! I have no go-to anecdote, but my husband and I do love to giggle about trying to speak Italian and always being spoken back to in English! What do you love most about Italy / Italians? Friendly people and great food! Seafood, pasta and pizza, my favourite food! I can eat anywhere in Italy, whereas I can struggle in other parts of the world being a Pescatarian. Which Bookings For You villa tempts you the most? There a dozens of beautiful villas and apartments, but for me it has to be one of the stunning refurbished Trullos. I particularly like the look of the quaint Trullo Aurora, which is beautiful, has a pool to relax in and there’s plenty of places to visit in the local area. And finally, do you have a favourite saying or quote about travel or sightseeing? Amalfi Coast – Beaches to see and be seen!